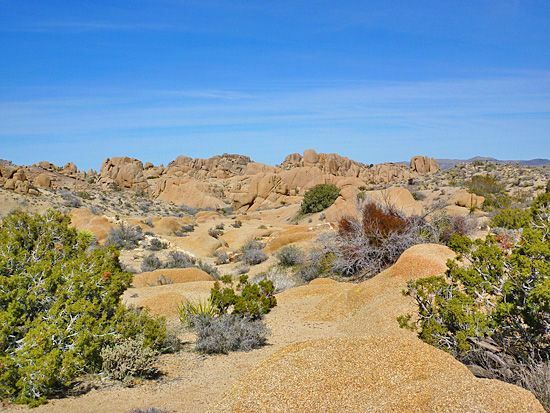 Monzogranite Rock is formed when molten liquid, heated by the continuous movement of Earths crust, seeps upward and cools while still below the surface. This plutonic intrusion yields a granitic rock called monzogranite. Monzogranite is often distinguished by rectangular joints. Horizontal joints are generally formed by erosion of miles of overlying rock, called gniess (pronounced nice). Vertical joints generally parallel contact with surrounding rocks. A third type of joint is also vertical, but cuts the second set at high angles. The resulting system of joints tend to develop rectangular blocks. Over time, arid conditions and flash floods have washed away protective, overlying ground layers. As they were exposed, huge eroded boulders settled on top of one another, creating the masive rock piles we see today throughout the Mojave Desert. Good examples of the joint system can be seen at Jumbo Rocks, Wonderland of Rocks, and Split Rock in Joshua Tree National Park.